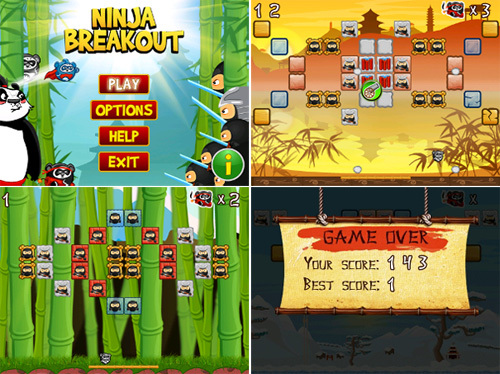 Ninja Breakout by XIMAD now available - Panda vs ninjas! Ninjas! Pandas! Ninjas and pandas!! XIMAD is on a role lately with games for BlackBerry smartphones and their latest free game has just been released. Ninja Breakout is a classic shooter game. You are the panda, fighting off the ninjas as they fall from the sky. Clear them out, and you progress to the next level. Of course, there are special power ups along the way to help you out, as well as obstacles to be overcome so you may get at those pesky ninjas. As to be expected from XIMAD games, the Japanese inspired sounds, music, and graphics are bright and detailed, and game play has no lag. With 40 levels of play, this game will entertain you for quite some time. Ninja Breakout is free and ad supported. However, if you'd like to remove the ads, you may do so via in-app purchase. This is a first for XIMAD, as they usually just offer up a free and paid version. I like this new streamlined method. This way you always know what you're getting before purchasing, without having to search first to see if there is a trial or ad supported version first. The ads don't hinder game play at all, and in fact are only seen when you complete a level, before continuing to the next. You can purchase the ad-free version at any time for $1.99. If you like the panda vs ninjas theme, be sure to check out XIMAD's Ninja Shooter too!